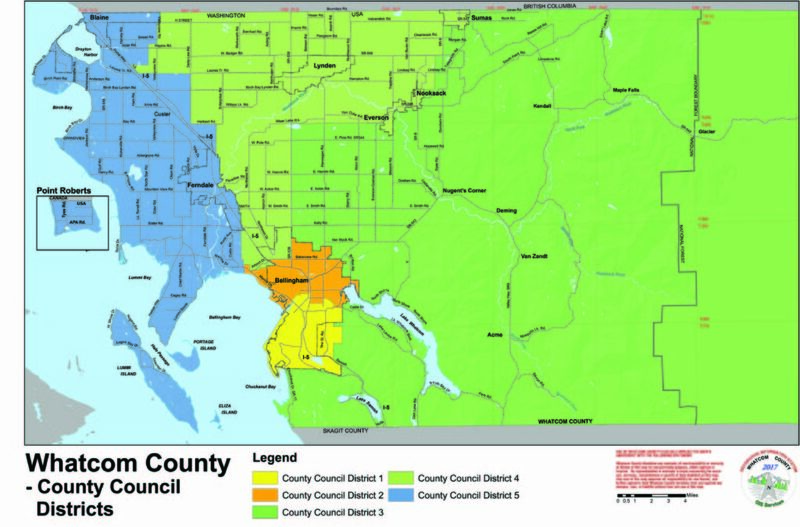 District 5, also known as the Coastal District, includes Ferndale, Birch Bay, Blaine, Custer, Lummi Island, Point Roberts and land west of Interstate 5 outside of Bellingham. Only voters living in County Council District 5 may vote for candidates running in Council District 5, in both the Primary and General Election. In 2015, Whatcom County voters approved a Charter Amendment to elect council members from five districts plus two county-wide. In a separate Charter Amendment, voters also approved electing Council members in district-only elections, rather than allowing voters across the county to vote for all positions in the general election. These new districts have been phasing in as incumbent Council members have come up for re-election, and 2019 will complete the process. No incumbent happened to live within the boundaries of the new 5th District, so it is an open seat in 2019. This will be the first time in about 20 years that the voters west of Interstate 5 will have a Council member from their area.